Monty Don advises on how to cut and maintain hedges and gives ideas on growing fruit in pots. 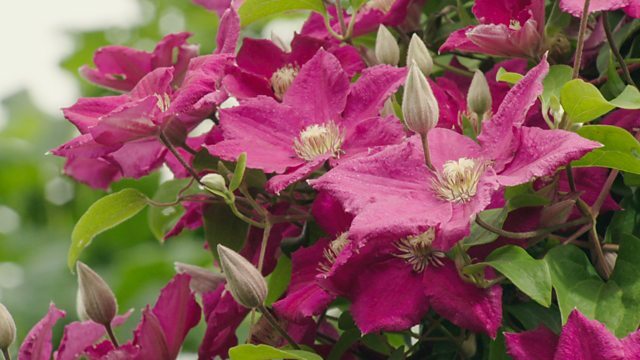 Carol Klein chooses varieties of late-flowering clematis as her plant of the month. I've just planted a Virginia creeper. It's called quinquefolia because it's got five leaves. and it will grow up 40, 50 foot or more if you let it. Of course you can prune it, but you will need to do that every year. is the best autumn colour going. and has a particular passion for heucheras. and is now threatening our natural coastal habitats. Hottentot fig are a huge problem to us. Sort of wiping everything else out? Yeah, that's all you have, is metre after metre of fig. that is filled with masses of plant inspiration. And I'll be planting some blueberries. I've decided on quite a dramatic change. and then took it out. but didn't obscure the view. "that would be a backdrop to the rest of the Jewel Garden." would shine out against the green. and I keep wanting to peer over the hedge. around the rest of the garden. So what it means is cutting this back. and not suitable, think again. You've got it wrong, cos look! Look at the growth on this. This is a good 12 inches of growth just in the last few months. is only three or four years old. and then a line of string at the correct height. it's a good idea to use string and canes to give you a guideline. Put it between the two ends. That needs to come down a little bit. is it regrows from old wood. It will grow back up if I want it to. and you won't do any damage. OK, let's go. Let's make the first cut. and shears for two reasons. is that you should never strain it. or slipping and cutting yourself. So wherever possible, much easier to snip away. ..is, does this look better or is it a catastrophic mistake? And I've just undone years of vigorous, healthy growth? it is easy to get slightly introverted. The whole horticultural world revolves round your back garden. and visit a really good garden, well, then it's doubly good. and the really good garden is Pettifers in Oxfordshire. and this one's been 30 years in the making. but somewhere that carries interest right throughout the year. "but how do we take ideas home that we can repeat?" And my answer to that is, do you know what? there's stuff there that we can repeat in any garden. with majestic views of the Oxfordshire countryside. It's been lovingly created by Gina Price. "I can make something of this." and I knew nothing, but nothing. making a lot of mistakes. When I started, gardening was rooms, you know. because the whole point was to bring the landscape into the garden. planted in drifts to evoke a naturalistic look. Every single bed is meant to be different. So it's interesting to look at them all. They've got a different slant to them, if you actually look at them. But there still seems to be a nice connection between them. I mean, I have favourite plants. which is the one on the left. The borders are really stunning. what's going to be left? And this is a prime example. there's interest right through the back end of the season. all the way through, and this is fantastic. and there's a bench stuck back in there, so I'm drawn to the bench. I'm engaging in the plants in a completely different way. All of a sudden, my eye line is the same height as the flowers. and they're all covered in wildlife. But you don't need this much space. that you can experience it in a completely different way. that is the most breathtaking. Do you know, that's absolutely beautiful. and ultimately this garden works on the borrowed landscape. And what is that in reality? so you really don't know where that garden finishes. But we can apply that at home. You don't need this big space. and that canopy comes towards you. sits a more formal area of real structure and interest. of this parterre that drew me to this garden, and it's stunning. But that word, structure, is important in our gardens. that structure becomes so much more important. it is a series of rectangles that work down a hillside. It gives you structure, it gives you form, it gives you colour. Not only now, but it carries you right throughout the year. It's a beautiful garden to be in. or if it's to your taste or not. that's going to make your own garden better. and it's a great way to find out. do come round every year, and once learned, you can always apply them. And rotation of vegetables is one of them. and these are ready to be taken out. and you follow brassicas with root crops. so you leave that untouched, and so the cycle goes. but as a basic rule, it's a good idea. And I've got some good kale. Very good for you, and looks lovely. ..and they're grown in plugs, and then potted on. And so we've got quite a decent-sized plant there. and ready to go. That's ready to grow out. ..and that will anchor it in the ground. This is going to get quite a large plant. the roots don't grow quickly enough to keep it balanced. So we want that good and strong. And the spacing needs to be quite generous. So, at least 18 inches. and it heats up quicker. The disadvantage is that it drains better! if it's very hot, dry weather. So that's something to watch. that's a problem that I'm happy to have. Because the alternative is wet, heavy soil that is cold in spring. These plants will stay here until next May. But at the moment, there is a lot of space between each plant. And either you're going to have to keep that weeded, or you can use it. You can get a cat crop. before the space that they're occupying is needed by another crop. which will match in colour with the purple red of the kale. lettuce, you just need to make a small hole, and pop them in. very quickly get their roots down into the soil. is to give it a really good soak. but I make sure everything is watered in really well. ..and usually it finds it. are at their very best. That's the late flowering types. as her plant of the month. there's one plant that's sprawling all over the place. This is a typical example of what most of us understand by clematis. It's Perle d'Azur, utterly beautiful. but all clematis need a host. In our gardens, we often grow them up trellis or structures. so their glorious flowers can be in the sunshine. but in actual fact, they're not petals at all. you can see there's no calyx at all. get longer and longer, and as they do, they colour up. and form these beautiful flowers. and their flowers in the sun. it's the moisture that they find there. incorporate plenty of organic matter. Mulch them thoroughly, and keep them well watered. If you do all that, you can even grow them in full sun. clematis are also easy to propagate. I've taken a nice big chunk here. but at this time of year it's really hard. or any buds that are yet to come. so you cut between these nodes. about an inch and a half to two inches below the leaf node. Just cut it across there. And then you want to trim it, to just above the next leaf node up. and two leaves either side. Now fill a pot with lovely, gritty compost. This is loam-based compost with masses of grit added. The stem is stiff, so it can be its own dibber. is actually flush with the compost. But there's another way, too. right down to the base. And you'll get two similar halves, twins. Finish the whole thing off with some grit. You can also try growing clematis from seed. snip off a whole head with a bit of its stem. and in a few weeks' time, you should see germination. is when do you prune them? and it's all to do with the time of year when they flower. you really hardly need to prune them at all. you can tie in some new shoots. they don't need much pruning either. 45 centimetres from the ground. and produce lots and lots of new flowering wood. This particular one is clematis viticella Etoile Violette. there's no doubt that August is their prime time. producing thousands of its deep blue bells over the summer. 15 centimetres above the ground in late winter. Clematis truly are the most versatile of plants. however big or small our gardens. that clematis are the glory of the August garden. but they've been really good this year. because you don't want to lose flowers. that will also reduce all the opportunities. if you take flowers out of the equation. is almost entirely on foliage. you're seeing things that you're not seeing somewhere else. I like something that is very different to anybody else's. "OK, I need to put in the larger specimens first." make sure you've got plenty of evergreens. Then work down to the shrubs. I don't think there's any hard and fast rules. Everything in my garden is good to look at. to what you've just seen round the other corner. I suppose it stems from wanting to be as low-maintenance as possible. the weeds don't have a chance. I love them because they offer so much. from yellows and lime greens through to the purples. almost throughout the year, because a lot of them are evergreen. which is heuchera French Quarter, and it's an absolute dream. this is the baby to have. Tiarellas are the poorer partner of the heuchera. They're generally a smaller plant. but they're not grown for their leaves. They're grown for their spring flowers. They have these masses of white or cream spikes in the spring. you might get another showing around about the end of July, early August. So they can flower twice in a season. so you're getting the best of both worlds. and the fancy colours and shapes of the leaves of the heuchera. My favourite is probably Gunsmoke. You look after them in exactly the same way. They're all shade-tolerant, all grow in the same sort of soil. And they're a nice spot of colour. As you come around the corner, there they are. with any of the group would be vine weevil. And that can be a horror. and it chews its way through where the crown meets the root. and the actual weevil has just chewed through the whole thing. from taking the cuttings. This is how we do it. so you're left with something like that. I then take it into a four-inch pot. Use a dibber, or in my case, a pen. Little hole in the soil. ..I put a label, so I know what it is! And then that goes in the polytunnel. And in three, four weeks' time, hopefully that will have rooted. and you've got extra plants as well. and in general they say, "A nice little cottage garden". I also ask them when they went out, "Were you surprised?" And they say, "Yes, but it was a nice surprise." the more pleasure I get just from simple, green foliage. It holds you exactly where you're meant to be. That is one of the reasons why I bought myself another tree fern. and it seems to be very happy here, in quite deep shade. It's a mistake to plant them, as specimen plants, out in the open. Give them the shade that they crave, and plenty of moisture. Don't let them dry out, basically. And they should be really happy. I'll be planting some blueberries. thanks to a team of dedicated volunteers. ..but I don't try and keep it CLEAN, as such. but it's certainly good for wildlife. And this is a wildlife pond. but what we don't want is too much dead material like that. I always leave by the pond. because there will be little creatures in it. And I want to give them a chance to go back into the water. and at what point you, the gardener, muscle in. and stop plants running amok. ..and let it dictate how it looks. there are certain plants that are thugs. it's duck weed that can take over. But it is easily remedied. can become a dominant monoculture. to see the effect of one of these alien invaders. The Lizard in Cornwall is Britain's most southerly point. that's threatening to destroy that accolade. and covered in pink or yellow daisy-looking flowers. that can still be bought in some nurseries across the country. But it's escaped over the garden fence. it can pose a real threat to our native flora. who own and manage this stretch of coastline. Rachel Holder is the ranger tasked with bringing it under control. So, Rachel, how big a problem is this carpobrotus? Invasives like Hottentot fig are a huge problem to us. a special area of conservation. and long-headed clover, and those species are affected. so our native vegetation disappears. So it's effectively a monoculture, isn't it? Just wiping everything else out. Yeah, that's all you have is metre after metre of fig. And so why is it so successful in this particular area? So it's really thriving in dry habitats in rocky places. when you touch the leaves. And we don't really have anything here that keeps it in check. Is the problem just isolated to the peninsular here? and perhaps with climate change, it may become a wider issue. So... Wow, that's quite tough. Yeah, it's really well matted. You can see just how well rooted it is. can root again and regrow. and pick the regrowth, year after year, really. it could re-root and become another plant. Yeah. And obviously you get seedlings as well. have been successfully removed from this coastline. There are certainly areas that we're keeping on top of it. The brown swathes down the cliffs there. -where you've cleared it out? we've managed to get rid of the fig. You can see the native vegetation coming back. But it's an ongoing battle. producing matter that can root and grow again. if they've got this growing or have considered introducing it? It's not illegal to buy this plant. However, it is illegal to cause it to spread in the wild. that would be an offence. there is a much greater chance of it spreading and getting into the wild. But who knows how far a bird can fly to spread the seed? and any of the other species that are known to be invasive in the UK. which is that Californian daisy. but it's not nearly as invasive. Yes, there's many things out there. I mean, only a very small proportion of garden plants are invasive. that you can try that won't cause a problem. and I imagine people enjoy this plant. but I think if we did nothing, we'd lose all those native species. but it really is important in a national and international context. being introduced and then taking over an environment is nothing new. so it's not going to take over your inland wet garden. Having said that, the effect on the coast is pretty dramatic. Right. Talking about drama and drama queens, you want that, don't you? Go on. There you go. I've got a wheelbarrow full of ericaceous compost. Ericaceous simply means it's acidic. It's got a pH of below six. which need a pot because my soil is too alkaline. And I thought, well, I can make them decorative. interesting fruits that look good. And because they're in good pots, I've chosen standard blueberries. Mix up a bag of ericaceous compost. This is based on bracken. which will help the drainage. Just mix it up well and put some in the base of a pot. Take that out of its container. so those don't need teasing out. That's ready to go. And the height that it needs to be is about that. I'm leaving the bamboo in. and they blow over in the wind. Right, let's firm that round really well. I'm leaving quite a gap from the top of the pot. it does mean that I can water it well and I can mulch it. And this is a long-term planting. This will stay in this pot for three, four, even five years. rather than at the sides. I'll plant up the other one. a path, immediately creates an impression. almost at mouth height, you could just pick them off as you pass by. That makes life much easier. and you'll undo all the good work of using an ericaceous compost. which means two things. One, the shape is not quite what I want. I want a rough pom-pom. when we get the first high wind. because the fruit is produced on the previous year's growth. with no fruit on it. But next year, that will carry fruit. So if I cut this right back, I'll have no fruit next year at all. another proper prune after the berries have all ripened. it produces fabulous autumn colour. Turns a lovely, rich burgundy, sometimes almost chocolaty colour. as good as possible all the time. especially under the NGS, because it is quite a thing. and I have to admit, it was absolutely terrifying. open in just two hours' time. have had their work cut out for them. part of an old country house estate, dates back to the 18th century. when they decided to return it to a working kitchen garden. Tony Brown is one of the trustees managing the project. I mean, it's that hidden element, isn't it? You wouldn't know this was here. No. It's very much a feature of gardens of this era. They had to be tucked away out of sight from the main house. his guests how well his kitchen garden was being kept. So what are you actually trying to achieve with this garden? Well, first of all, to save what is an important historic site. And to demonstrate what is possible in a garden like this. and flowers, not even counting the fruit. when they come through that gate of colour and vibrancy. to arrive for the garden's first open day. they inspect it for quality and character. for no less than 30 minutes. They've crammed so much into this garden. and there's the beautiful scent coming from Cupani. It is just a wonderful garden to be in. The volunteers are obviously enjoying themselves. But what do the visitors think? -What do you like about it? -Oh, it's my kind of garden. so it's lovely to come out and see. getting them to look so good. You've got this wonderful little display here. and trying to make it look pretty. And then you're growing radishes, aren't you? got a better chance of surviving. you're likely to dig it up because you won't know the difference. So these are called little plugs and you've got this special little tool. You don't damage the plant at all. So you very, very carefully bring it out. these will start spreading out. and what you do, you wrap sellotape round your hand. When you go like that, they all jump up and get stuck to the sellotape. but the whole garden is one big community, isn't it? -So, it's so brilliant like that. with the old in the garden. that would have been here. which was first developed by Thomas Knight in the early 19th century. It's quite a dwarf tree, isn't it? Is it on a dwarfing rootstock? That's right, so we're only going to grow four tiers. So anyone at home with a small space could do this against a wall? for the size of the tree. And have you actually been taught how to prune? No, we were told the trees were coming. -And so far, they're looking all right. -..right down to a stick. Yeah, that's quite nerve-racking, isn't it? -That's why Julie has to do that! so we are just beginning the second year of the espalier. Do you think these are going to taste really nice? but we will enjoy it no matter what. can be enjoyed by the wider community for years to come. I know that you've got over 100 people. -We've actually got 320 today, which is fantastic. Good boy. Come on, there's a good girl. and a garden shared is a garden enlarged and enhanced. Obviously, growing veg is enormously satisfying. ..the job is not done. and that is to deadhead and keep deadheading. as long as possible if you keep deadheading. and put them straight into a polythene bag. Cut them to size, burying them right up to the foliage in the compost. ready to plant out by next spring. are irresistibly drawn to brassica leaves. to stop the butterflies reaching the leaves and laying their eggs. still check weekly for any caterpillars that may be there. but I grow them as annuals. so a really dramatic plant. the gaps and give you colour until the first frosts. but let's see what weather is in store for us gardeners. but not of today's programme, I'm afraid. Monty Don gives advice on how to cut and maintain hedges as well as giving ideas on growing fruit in pots. Carol Klein chooses varieties of late-flowering clematis as her plant of the month, Nick Bailey travels to the southern tip of Cornwall to seek out a plant which escaped from our gardens and is now threatening rare and native plants, and Adam Frost uncovers the secrets of successful planting combinations in an Oxfordshire garden. Mark Lane joins the enthusiasts who have lovingly restored a walled garden in Warwick as they open their gates to the public for the first time, and we visit a garden in Yorkshire where foliage and not flowers are of paramount importance.